There is a clear sympathy for the plight of the blind man; a man with no hands elicits our heart felt compassion and the cry of the deaf mute is heard however faint. But we always weigh our sympathy for the fat man. A person suffering from morbid obesity is less deserving of our sympathy than the drug addict or the alcoholic because, like it or not, we regard food as one of the greatest pleasures in life. How can you feel sorry for someone apparently enjoying himself to the fullest? I first met Valentin in his hospital room. It was his first time in Bucharest and I could tell by the look in his eyes that he was lost and scared. It’s not often one can observe up close a 245 kg naked man, so I wasn’t far from being scared myself. He was there to meet with the doctor and prepare himself for a stomach sleeve procedure. We talked. I guess because he was scared he felt like talking to someone. It was there and then he told me the story of his life for the first time. The emotions on both sides where so high I couldn’t make much sense of what he was saying. He told it again and again later in his home town of Pojejena and each time I felt like I was having flashbacks, like I had known Valentin for a long time. On April 22, 2013 I arrived in Pojejena for the first time. Valentin was driving his horse and wooden wagon, doing community work so that he would not lose his social benefits. In preparation for the stomach sleeve procedure, he was supposed to lose at least 30 kg. He was in the middle of a dire diet exercise. To help with that, he was undertaking all sorts of physical chores like spading in the back of his uncle’s house. Valentin returned to regular employment. But it all went down the drain when the mining company he was working for had to let him go as they were on a straight path to go under. With the redundancy payment and money he had saved he bought an apartment. But with no perspectives for a new job, he soon ran out of money. Unwisely, he borrowed from loan-sharks and when he could no longer keep up with the payments he lost his apartment. Luckily, together with his girlfriend Katie, and their 3 kids, he was sheltered by his uncle in his less than modest house. He gave them the best two rooms in a small area next to the stables. This blow was too much for Valentin. My feeling is that if he wasn’t a religious man, and somehow scared of the eternal consequences, he would have chosen to end his life there and then. He decided instead a much slower death. Like some people that drink themselves to death, he soon started to eat himself to the same very end. Little did he know that on top of the pain of losing his apartment, he was now embarking down a spiral of long and painful humiliation. In many respects, being fat is like being a drunk. Up until the day he dies, the drunk man is looked at as the man that knows how to have a good time. When the drunk man becomes violent things get broken. The fat man breaks things just by sitting on them. When the drunk man pisses himself because he loses control, the fat man can no longer urinate standing. If it wasn’t for Katie, his loving wife, he would still be trapped with no hope. She, together with a teacher from the village, wrote to a doctor in Bucharest pleading for his case. They could not afford such an operation so they needed the doctor’s help and compassion. And they got it. Two years later Valentin weighs less than 140 kg. He is active, and if you think back, his recovery is nothing short of a miracle. He reclaimed his life and he is once again full of hope. The day that I arrived in Pojejena on March 17 2015, he received a phone call from an international company producing electric cables for cars. Following one year of medical investigations and high hopes, the company called to let Valentin know he was finally hired. He should have lost more kilos but post operation diet is crucial. Quality diet and being poor don’t go well together. Strangely enough it’s almost like only those that can afford to eat can eventually lose weight. Valentin Anoca, weighting 245 kg, talks about the summer days when he swims in the Danube, as seen in Pojejena, almost 500 km west of Bucharest, on April 23, 2013. Valentin is scheduled to receive a stomach sleeve procedure mid May 2013. 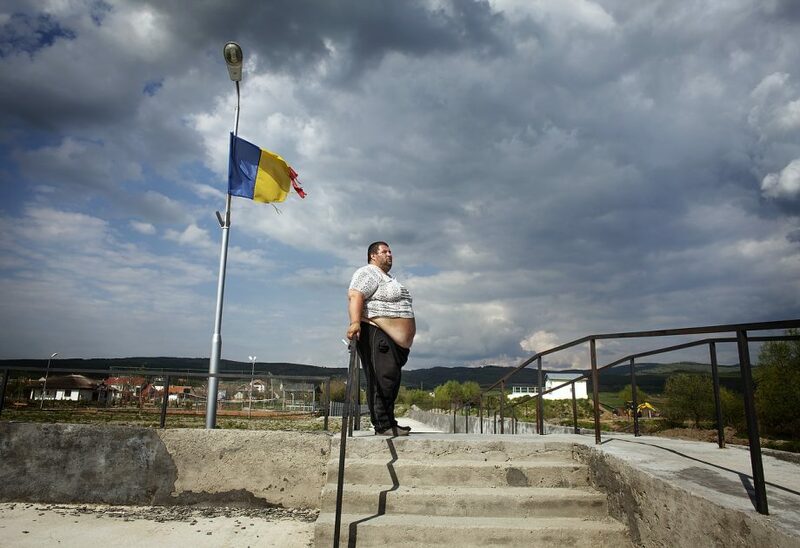 Valentin Anoca, weighting 245 kg, resting in the shadow after spading the soil, as seen in his uncle’s backyard in Pojejena, almost 500 km west of Bucharest, on April 22, 2013. Valentin is scheduled to receive a stomach sleeve procedure mid May 2013. 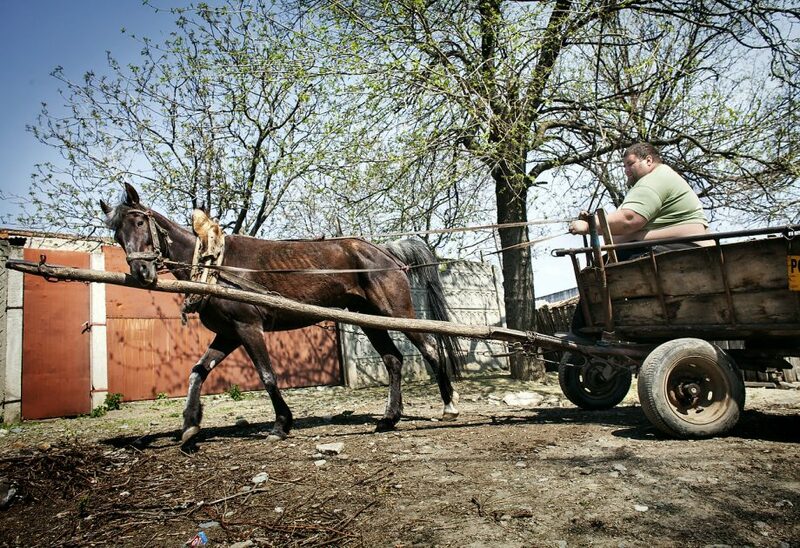 Valentin Anoca, weighting 245 kg, uses his horse wagon, while performing community work as part of his social aid contract, as seen in Pojejena, almost 500 km west of Bucharest, on April 22, 2013. Valentin is scheduled to receive a stomach sleeve procedure mid May 2013.